EO Nashville members always have great things happening. Take a look at what they’ve been up to this week. 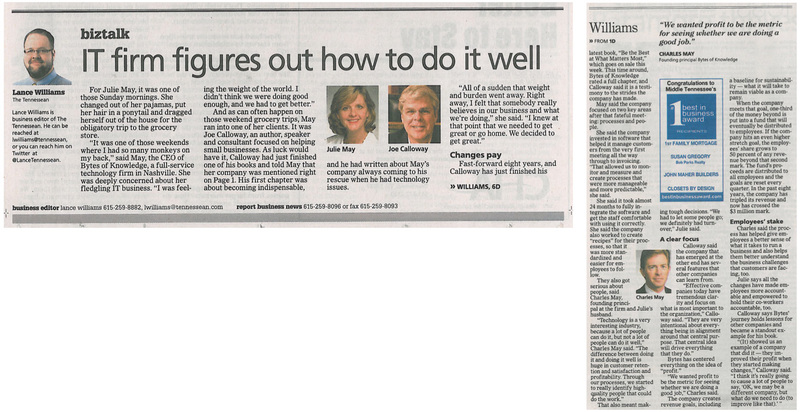 Randa Solutions [Marty Reed] was mentioned in the Nashville Business Journal last week. To read the story, click here. 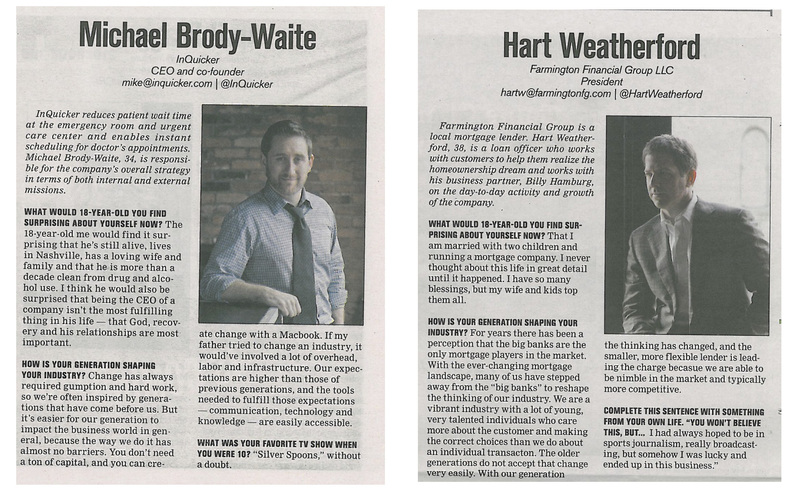 Congratulations to Michael Brody-Waite [InQuicker.com] and Hart Weatherford [Farmington Financial Group LLC] who were named to the Nashville Business Journal’s 40 Under 40 list. Read more about them here. Dan Hogan [Medalogix] was mentioned in a Chattanooga Free Times Press article for his reasons in backing the TennCare expansion. 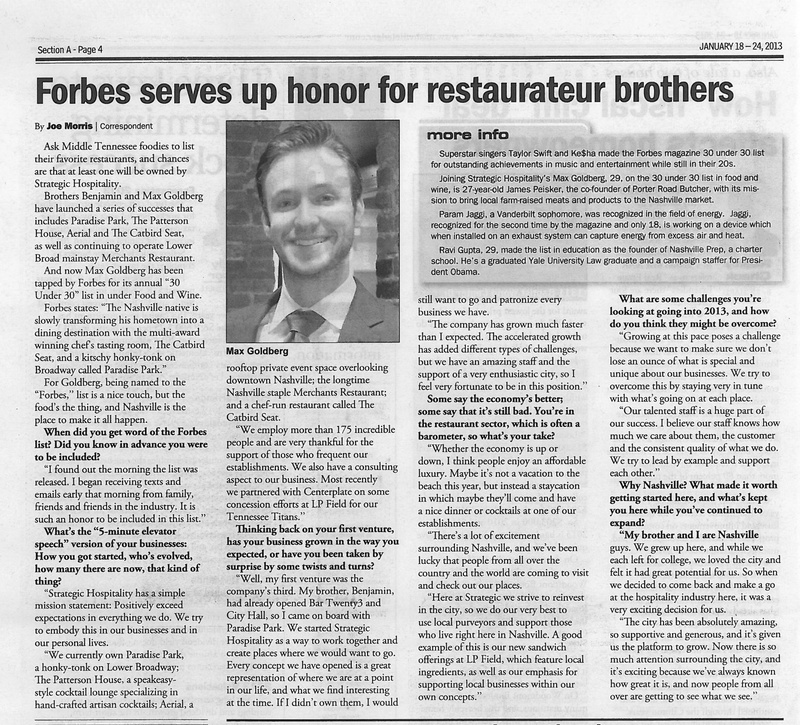 Ben Goldberg [Strategic Hospitality LLC] was featured in the Wall Street Journal Magazine, which described Ben and his brother Max as two who have almost single-handedly ignited Nashville’s food scene. 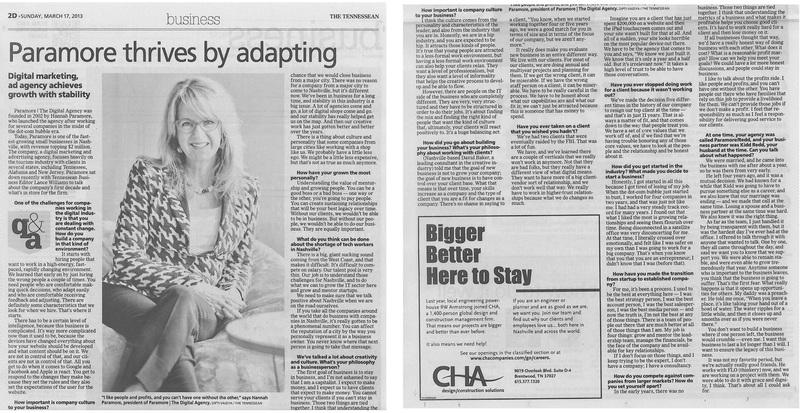 Bytes of Knowledge [Charles and Julie May] was highlighted in Sunday’s Tennessean. The story details how Bytes of Knowledge turned their business around after a certain interaction with author Joe Calloway. Read the full story here. Hannah Paramore [Paramore | the digital agency] appeared in The Tennessean’s Executive Q&A Sunday. Read her answers here. Two members of The Kingston Group [Ricky Scott] were featured in a Q&A with The Tennessean. The article was published Sunday. James Fields’ [Concept Technology Inc.] column appeared in The Tennessean Sunday. 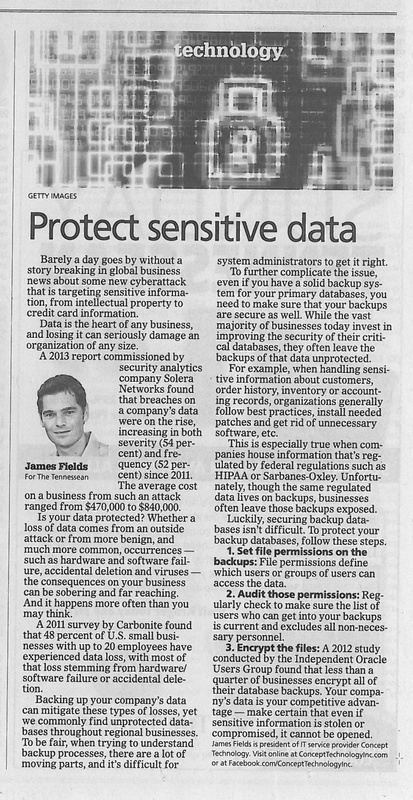 In his column, James discussed the importance of backing your business’ data and provided steps with how to do so. Andy Bailey’s [Petra] bi-weekly column in The Tennessean Thursday. He discussed his top 10 business books. To see what they are, click here. 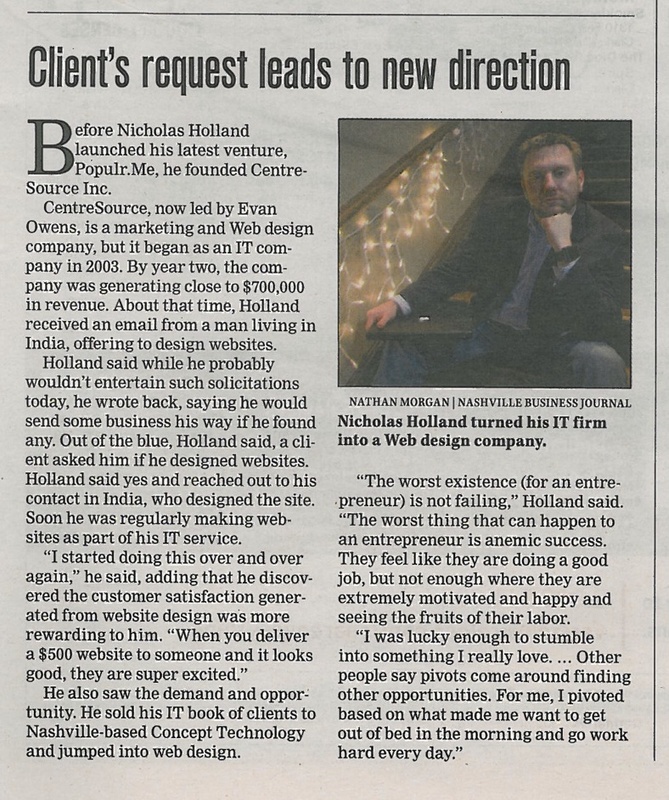 Andy also appeared in Small Biz Daily where he is a guest blogger. His blog detailed the steps to finding your star clients. Great write up in Sunday’s Tennessean about our Catalyst program. The article featured Amy Tanksley who joined Catalyst to boost her small business, Uncle Classic Barbershop. By the end of the program, Tanksley said she felt more confident as a business owner, and has even gained the momentum to open up a third location. 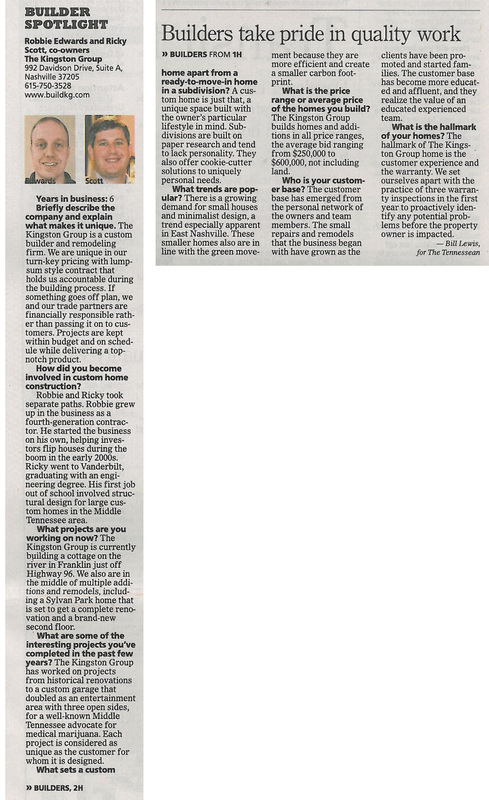 The article also included quotes from EO member Bryan Ansley [FNB Merchants]. The Tennessean article has been posted below for your viewing. A chance encounter in her commercial real estate broker’s office lobby helped Nashville entrepreneur Amy Tanksley put her business on the fast track. It was in that lobby that Tanksley met James Fields, owner of Concept Technology and a member of the Nashville chapter of the Entrepreneurs’ Organization. When he learned she also was a small-business owner, Fields invited her to visit the EO group, which targets high-growth entrepreneurial companies. The organization has more than 120 chapters worldwide; Nashville is one of the organization’s fastest-growing chapters. Tanksley, owner of Uncle Classic Barbershop, was too small to join the group initially (companies need at least $1 million in annual revenue to join), but she seemed the perfect fit for the group’s new Catalyst program, an 18-month program aimed at helping grow fledgling startups into fast-growing companies. Instead, she found a roomful of entrepreneurs who knew her struggles. Most importantly, Tanksley said the program helped contribute to her bottom line. Overall, companies involved in the chapter’s first Catalyst program grew annual revenue by 53 percent. Now, a second group of entrepreneurs is going through the program, and EO is taking applications for a third group that will start this August. Bryan Ansley is co-chairman of the Catalyst program, which is unique to the Nashville EO chapter. “If (entrepreneurs) take time to sharpen the saw, it’s going to definitely pay dividends,” Ansley said. Still, Ansley said the program does require a big commitment. Over an 18-month period, a company must commit to about 100 hours of meeting time, and a fee of $2,500. He said the program’s participants had annual revenue between $250,000 and $1 million before the program started. By the end, more than 40 percent had crossed the $1 million mark. He said the program’s fee was designed to be affordable, but substantial enough to make business owners get serious about the program. “If you just give something away for free, it’s not as appreciated as much,” Ansley said. The Catalyst program begins with a series of classroom lessons with Michael Burcham, head of Nashville’s Entrepreneur Center. “We are trying to teach them the habits that will allow them to work on their business, rather than just in their business,” Ansley said. Following the intensive series of classroom sessions, the next several months focus on group meetings where entrepreneurs share their experiences and give each other feedback and support. For Tanksley, entrepreneurship was an entirely new experience. As the daughter of a doctor, she always thought her path would be to get an education and go work for a corporation for her entire career. But when she thought about returning to school to get her MBA, Tanksley and her husband decided to pursue a dream of opening up a barber shop. Instead of using the money for graduate school tuition, they used it as seed money to launch her business (her husband remained in his corporate job after the launch). By the end of the program, Tanksley said she felt more confident as a business owner, and has even gained the momentum to open up a third location. “It was worth taking the risk,” she said. It’s not a surprise that we have lots of news to share with you this week. EO Nashville members have been busy! 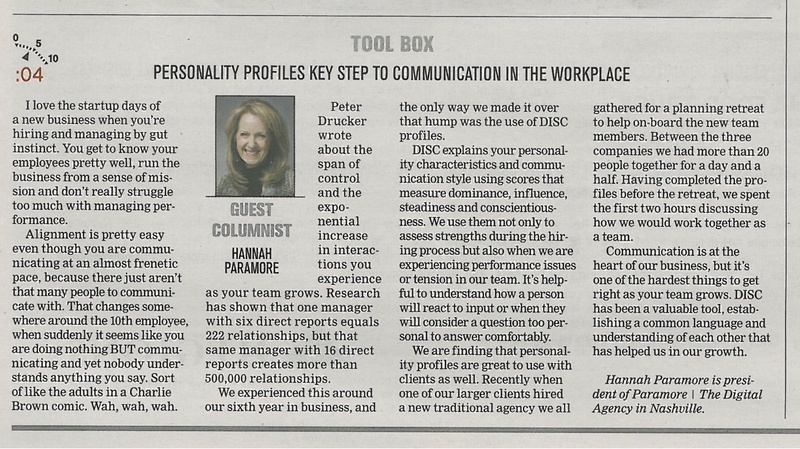 In last week’s Nashville Business Journal, Hannah Paramore [Paramore | the digital agency] discussed the significant impact DISC profiling had on her business. 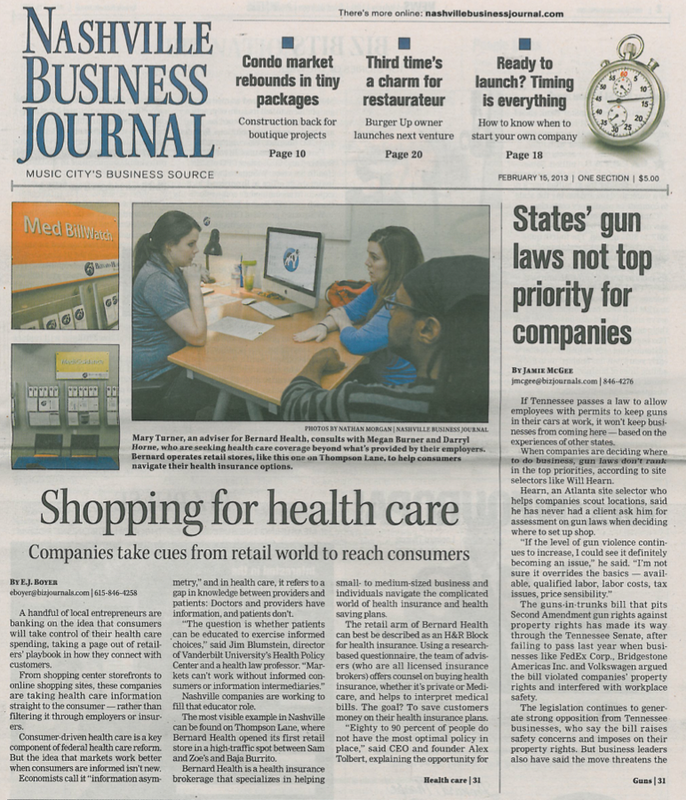 Bernard Health [Alex Tolbert] was highlighted in last week’s NBJ as one of the companies taking the cue from the retail world and changing how they connect with customers. James Fields’ [Concept Technology Inc.] bi-weekly column appeared in The Tennessean on Sunday. In this week’s article, James discussed the benefits of versioned replication as a means to backup your files. Bongo Java [Bob Bernstein] which, in 1993, opened as the first coffeehouse to establish a lasting foothold in Nashville. The Scene also noted 1996 as the year Bongo Java’s “Nun Bun” made national headlines. Catbird Seat [Ben Goldberg], which opened in the fall of 2011, for getting immediate acclaim from The New York Times, GQ, The Wall Street Journal, the Today Show and more. InQuicker.com [Michael Brody-Waite] has gotten lots of press recently. 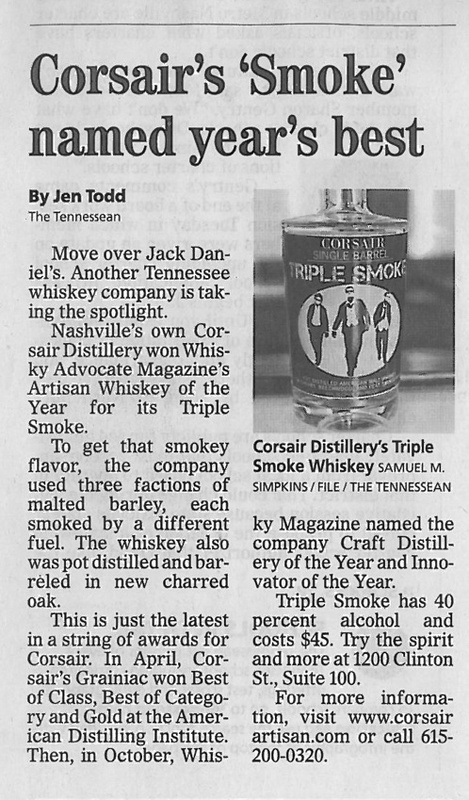 Last Friday, the Nashville Business Journal featured the company twice. Click here and here to see the stories. The Phoenix Physicians group invited members of the company on their radio program to do a Q&A. Listen to a replay of the show here. CBS covered InQuicker’s launch in San Antonio. Click to read more here. News-Line for Home Care Professionals featured Medalogix‘s [Dan Hogan] new software, Medalogix 2.0. The newly-released software is the newest version of the company’s post-acute specific predictive modeling software. 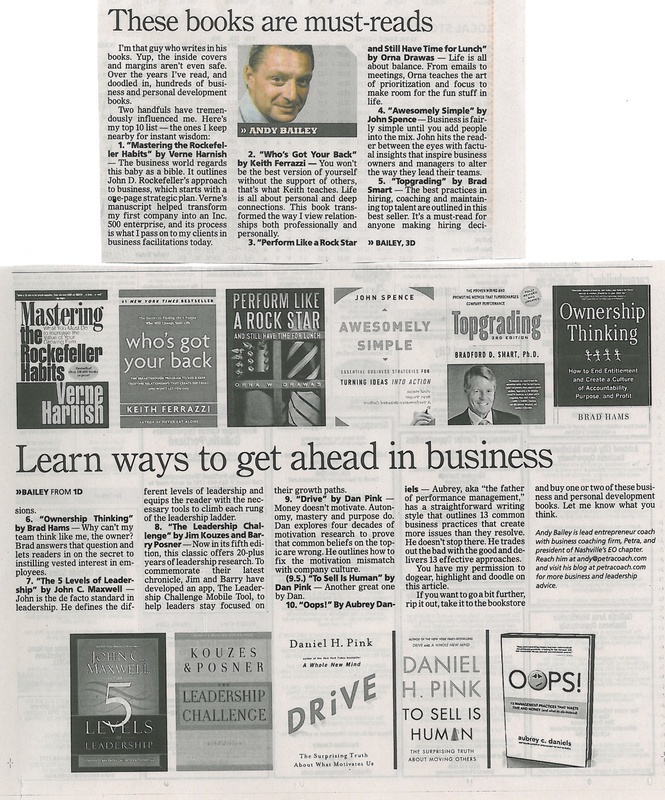 David Waddell [Waddell & Associates] appeared in this week’s Nashville Ledger. In his column, David discusses the saying “As goes January, so goes the rest of the year” and the likeliness that a strong January predicts a strong annual return. Clint Smith [Emma] and Charles Norton [Bone McAllester Norton] were panelists today at NBJ’s Entrepreneur Exchange where attendees were able to get in the minds of real business owners and learn what works…and what doesn’t. In his column in today’s Tennessean, Andy Bailey [Petra Coach] discussed his love for quotes and how they can have a positive impact in the workplace. Congratulations to the following EO Nashville member companies who were named Nashville Business Journal’s 2013 Best in Business Awards finalists. Advance Financial [Michael Hodges], Bernard Health LLC [Alex Tolbert], Farmington Financial Group LLC [Hart Weatherford] and Vaco Resources LLC [Jerry Bostelman]. 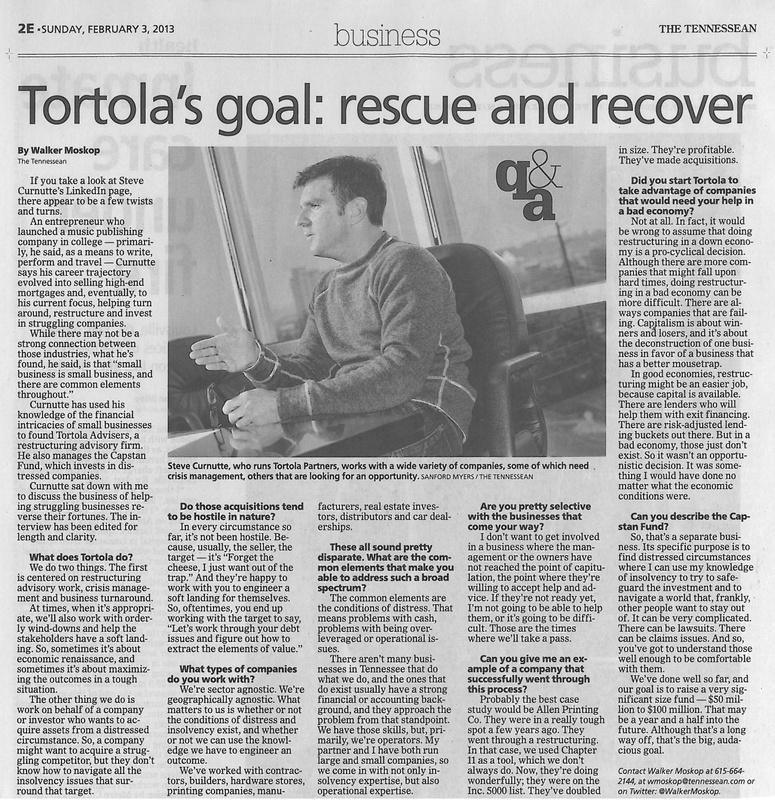 Steve Curnutte [Tortola] was featured in The Tennessean’s Executive Q&A section Sunday. To read to Steve had to say, click here. John Rowley [Fletcher | Rowley] appeared on MSNBC’s Melissa Harris-Perry Show Saturday morning to discuss GOP lines on immigration reform and the history of America as an immigrant society. George Uribe [GuestBooker.com] announced the launch of his new business, MyDailyRunDown, an innovative new Web product tracking television news. For more information, check out https://mydailyrundown.com/. 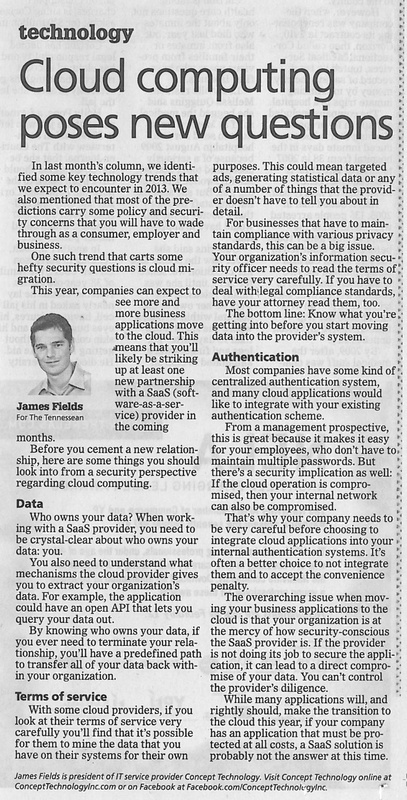 Sunday’s Tennessean featured James Fields’ [Concept Technology Inc.] column about cloud migrations. To read more, view the full article online. Petra Coach‘s Mandy Burage also appeared in Sunday’s Tennessean. 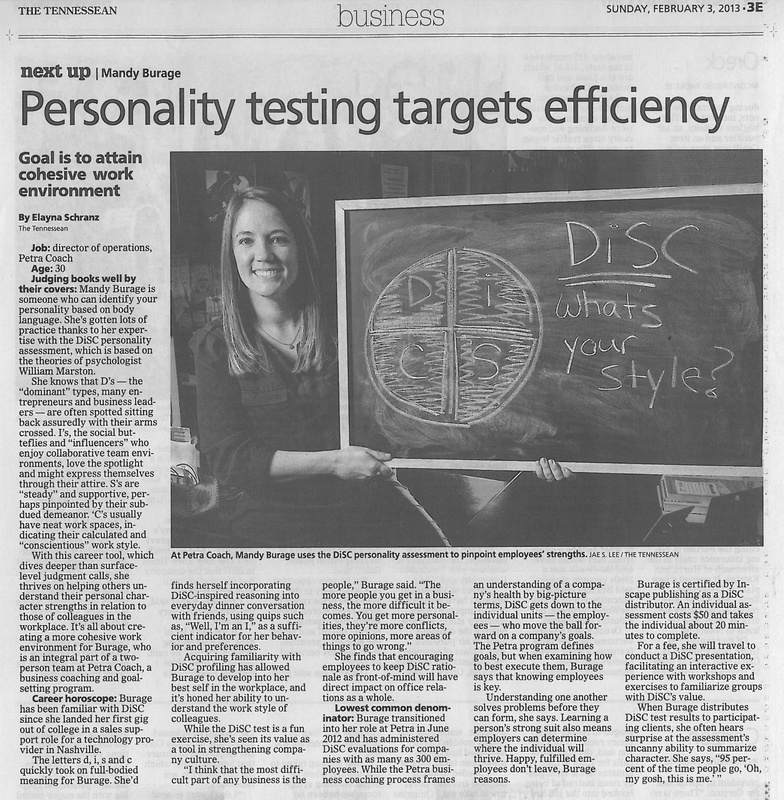 The article discussed Mandy’s vast knowledge of DiSC personality assessment. Andy Bailey’s [Petra Coach] column “Make the Decision to be Decisive” appeared in MWorld Magazine this month. The column can be read here on Petra Coach’s blog. Andy also had a column in The Tennessean today. In today’s column, Andy discussed how Nashville, now nicknamed “Nowville,” is growing and you need to be prepared. Hey EO Nashville members, here’s your weekly wrap up. Nicholas Holland [Populr], who launched Populr last Tuesday, was featured in VentureBeat last week. David Waddell’s [Waddell & Associates] column appeared in last week’s Nashville Ledger. In his column, Waddell discussed three keys to determining stock success. 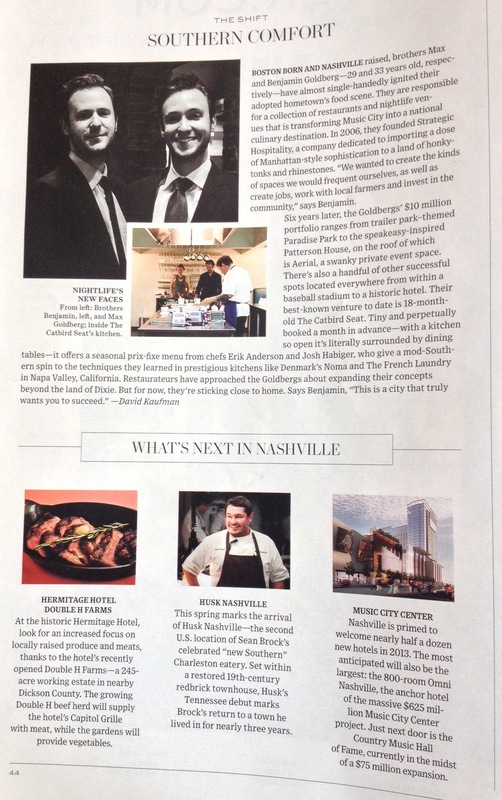 Benjamin & Max Goldberg [Strategic Hospitality] were featured in the Nashville Ledger on Friday. Read the article here. 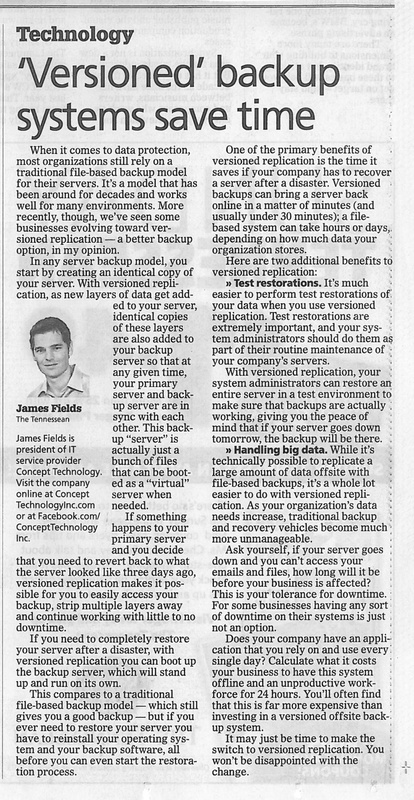 James Fields’ [Concept Technology Inc.] bi-weekly column appeared in The Tennessean on Sunday. This week’s article discussed 4 more trends for 2013: cloud migration, 3D printing, the ideal viewing experience and insourcing. Miranda Pontes [Burger Up] was featured in The Tennessean yesterday. 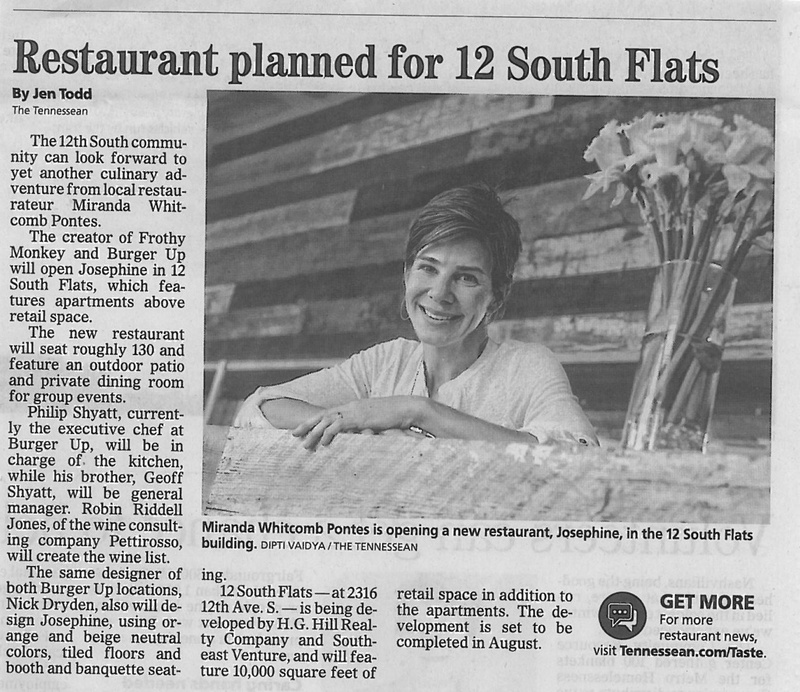 The article announced her plan to open a new restaurant in the 12South Flats. The restaurant will be called Josephine. 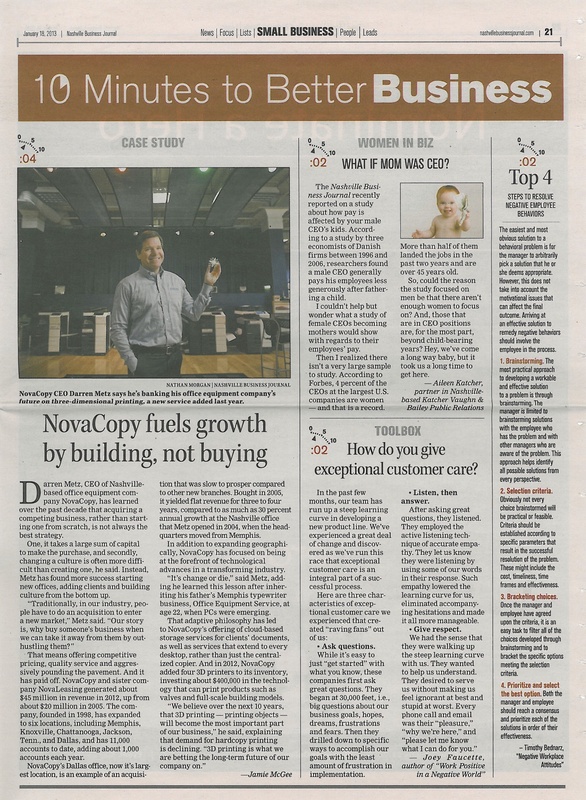 NovaCopy [Darren Metz] was featured in the Nashville Business Journal’s “case study” section on Friday. The case study detailed how NovaCopy fueled its growth by building, not buying. Congratulations to Corsair Artisan Distillery [Darek Bell], whose Triple Smoke Whiskey won the “Artisan Whiskey of the Year” award for Whisky Advocate Magazine. The Tennessean announced the news yesterday. Andy Bailey’s [Petra Coach] column appeared in The Tennessean this morning. This week’s column discussed five routines to incorporate into your business practices. 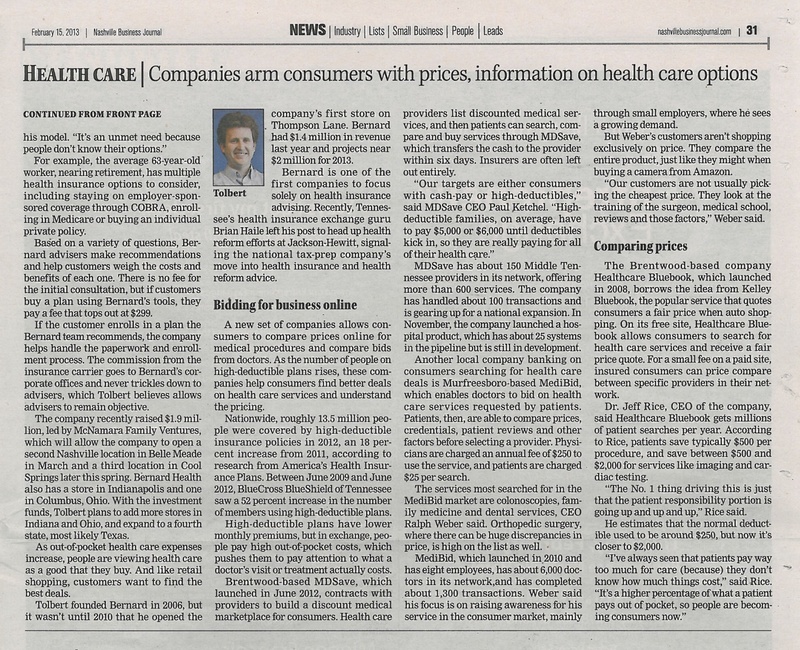 Medalogix [Dan Hogan] was mentioned in today’s Nashville Business Journal as one of Nashville’s local companies that has sprung up to bridge that gap between patients at home and their clinicians. It’s time for another weekly roundup. Here’s what your fellow EO Nashville members have been up to. James Fields’ [Concept Technology Inc.] column appeared in The Tennessean last Sunday. This week’s column described four technology trends for 2013. Dan Hogan [Medalogix] appeared in the January issue of Predictive Modeling News. In the article, Dan discussed predictive modeling in healthcare.